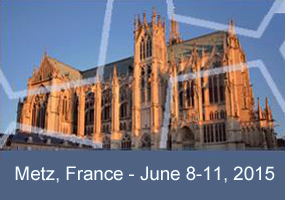 We are very pleased to welcome you in Metz, from June 8 to 11, for the XVI International Conference on Heterocycles in Bioorganic Chemistry. The conference is a continuation of the series started by Professor Henk van der Plas in 1980. Since that time the boundaries of bio-organic chemistry have been expanded significantly and we feel it is time to learn about the latest progress in the field. The objective is to facilitate fruitful interaction of young scientists with internationally recognised speakers selected with the help of the members of the Scientific Committee. The XVI Conference of this series will again gather chemists from all over the world, involved in the chemistry of heterocycles. The heterocycles in this case will generally be submitted to biological tests, both in medicine as in agriculture. The scientific programme will include 8 plenary lectures and 9 invited lectures by top chemists in the field and will be completed by oral communications and poster presentations. The conference is intended to synthetic chemists interested in heterocycles and biological activities.